Animating a realistic conversation from scratch is very difficult, so using real people as a base can make all the difference. Videogames' ability to tell stories has evolved pretty rapidly over the last twenty years. The rolling text is gone, replaced with full voice acting and near-photorealistic graphics. Ironically though, as the characters in our games start to look and sound more real, they don't always feel more real, because a lot of the subtle body language in real conversations is missing. That's where motion capture comes in, which allows developers to blend performances by real actors together with digital animations. In Issue 296 of The Escapist, Blaine Kyllo examines the growing use of motion capture technology in videogames, and how it's added a new dimension to videogame storytelling. 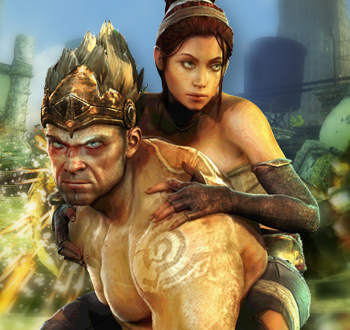 There's a moment early in Enslaved: Odyssey to the West when it's easy to forget that Monkey and Trip are digital characters in a videogame. It's after the crash of the slave ship, when Monkey wakes to discover that he's wearing a slave headband. As he stirs, Trip, the young technical genius, sits a short distance away, thin arms wrapped around skinny knees. She watches him with wide eyes. She's not sure if the headband she's hacked will work the way she expects, and she's equally unsure how the lithe and powerful Monkey will respond to being under her control. Trip doesn't say any of this. There's no dialogue to tell us what's on her mind. We know what she's thinking because we can read it on her face and can see it in her body language. The same way we can sense Monkey's confusion by how his mouth twists, and his suspicion by the way his eyes narrow when he looks at Trip. "So much of our communication is non-verbal," explains Tameem Antoniades, chief creative ninja at Ninja Theory and the designer of Enslaved. "We can tell whether you're lying or whether I'm telling the truth just by looking at each other's eyes and faces." Using motion capture, and specifically performance capture, where dialogue is recorded at the same time, games can draw the players into the story more completely. You can read more about it in Kyllo's article, "Show, Don't Tell."